I try not to be too dramatic when a bee buzzes near my face, but the truth of the matter is that the last time I was stung, my forehead swelled up so much I couldn’t see for a week. The only relief was that I was up a mountain in Spain so I didn’t have to scare the locals. But after that experience, I think I’m allowed a semi-rational fear. Look at how close I am! 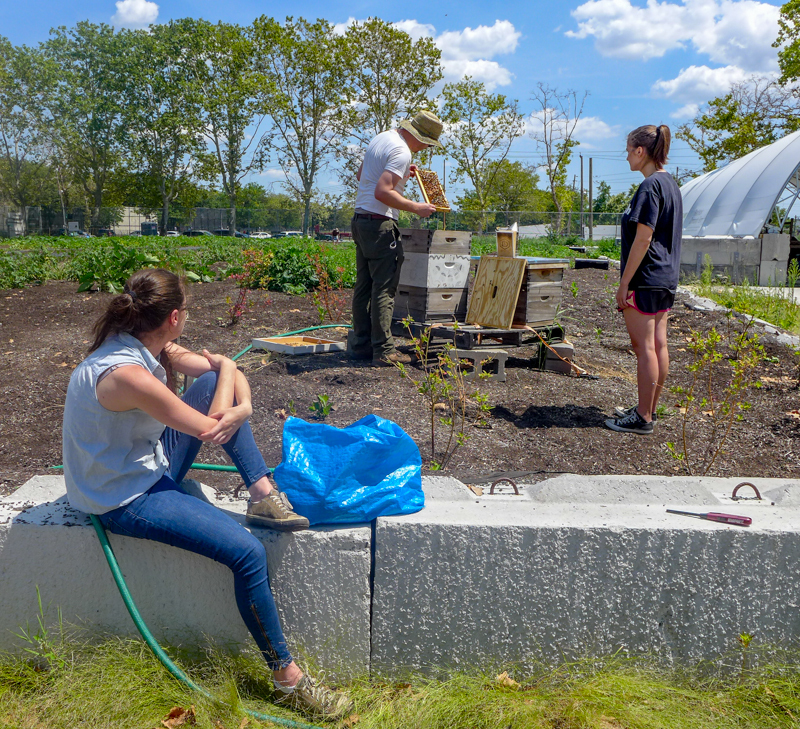 On Saturday, after our stint tilling the fields, Ryan and I met the Red Hook Bees, and I learned a ridiculous amount – including that they’re actually pretty friendly. 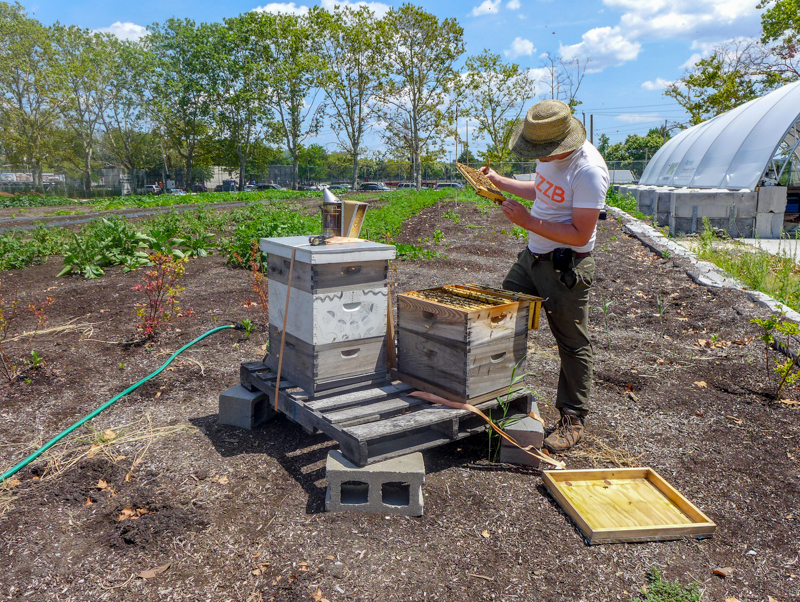 With no protective gear, we stood and quizzed Tim the Beekeeper about his hives as he checked on the 30,000 bees to make sure they were healthy. At one point, as I listened to his wisdom, I even stuck a finger between the bees’ slurping heads and dunked it in the honey. 1 :: In the holes of the honeycomb, baby bees are fertilized and incubated before breaking through to join the hive. We actually saw a baby bee crawling through the hive; it was distinguishable because it was so fluffy. 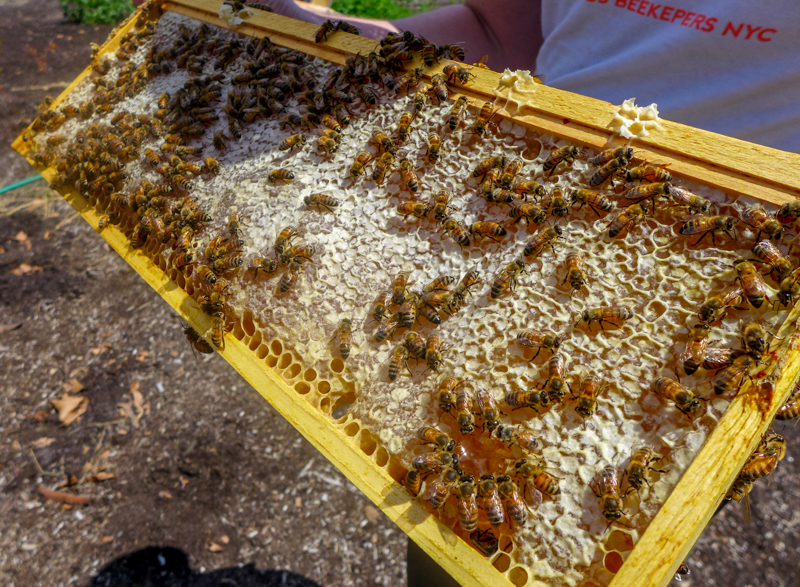 2 :: The yellowish wax material of the honeycomb is excreted from the bees. Tim explained that the most comparable thing in humans is sweat. And sometimes the wax is darker thanks to bee feces. So, in other words, that stuff you slather on your toast has been cooked up in bee sweat and poo. 3 :: Tim said that we may think these clever little guys are making perfect hexagonal shapes, but they’re actually making circles then shaped like hexagons because of the pressure of the other circles around them. Being pushed together like this is the most economical use of space because it means no gaps. 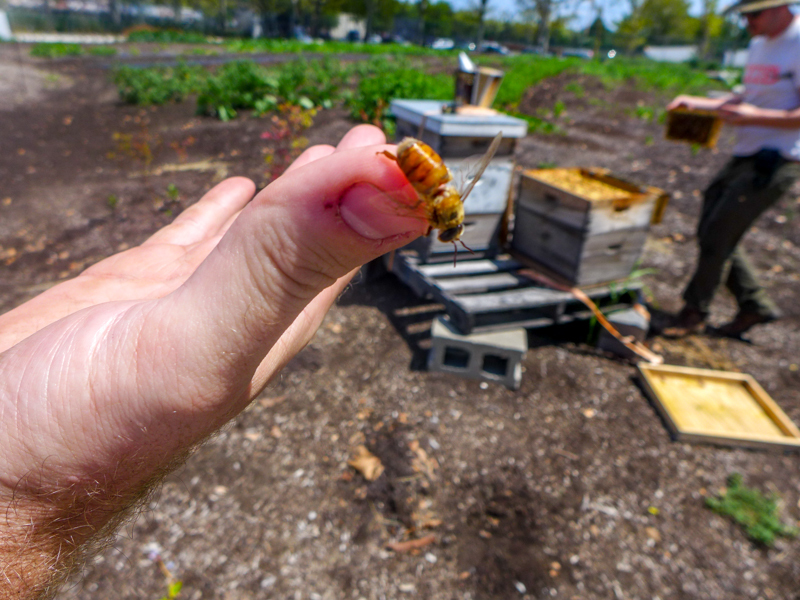 4 :: Male bees (called drones) have peens, which means they don’t have stingers and they’re entirely harmless. Ryan even held one at one point. 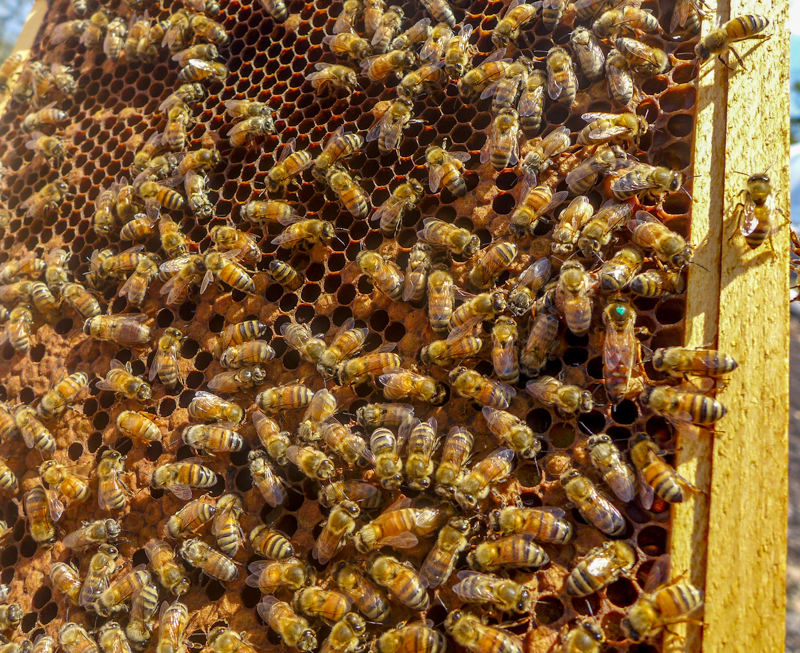 5 :: Male bees basically live to mate, while the females are the workers. 6 :: The queen is the only one who lays eggs and can control their gender. She can lay more than 1,000 every day. Ouch. 7 :: When they’re fed up of the queen, the other bees starve her until she shrinks. 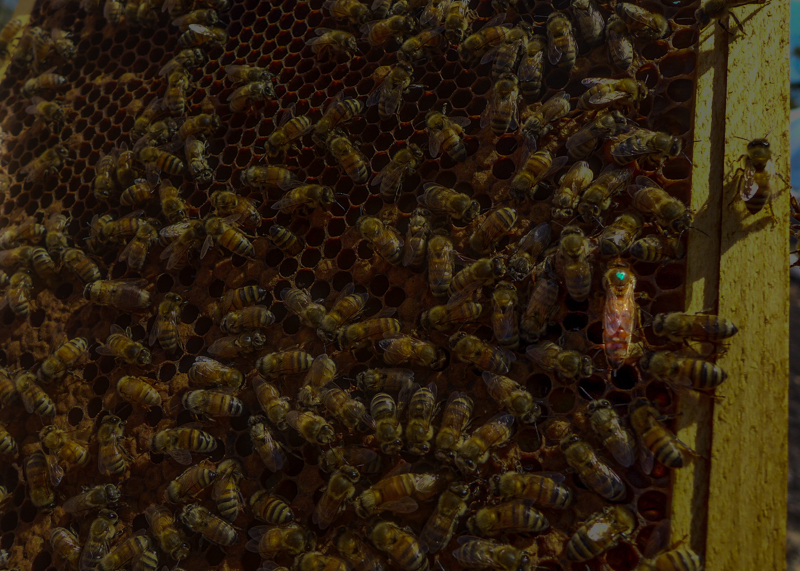 She will often leave the hive before the new queen takes over. 8 :: The oldest age for a queen bee is five. 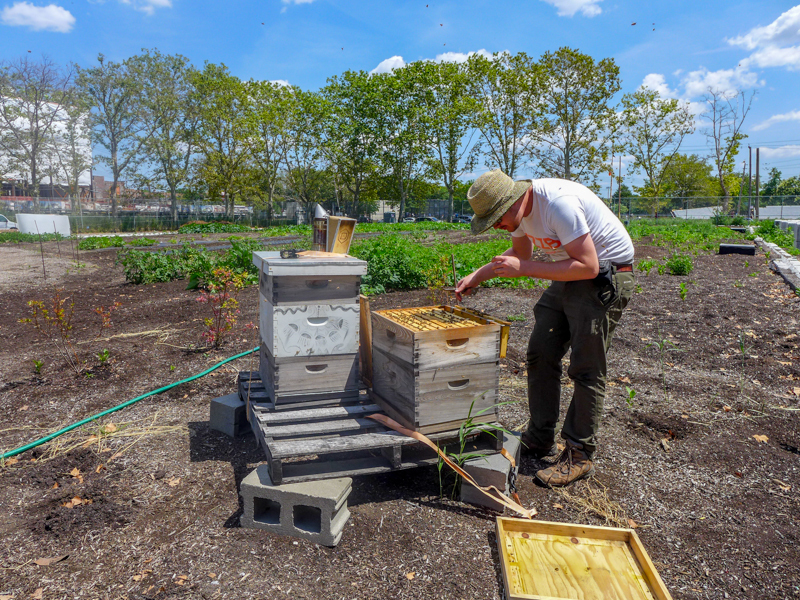 The one at Red Hook has been marked with a green dot so that the beekeeper can keep an eye on her. Can you see her in this picture? 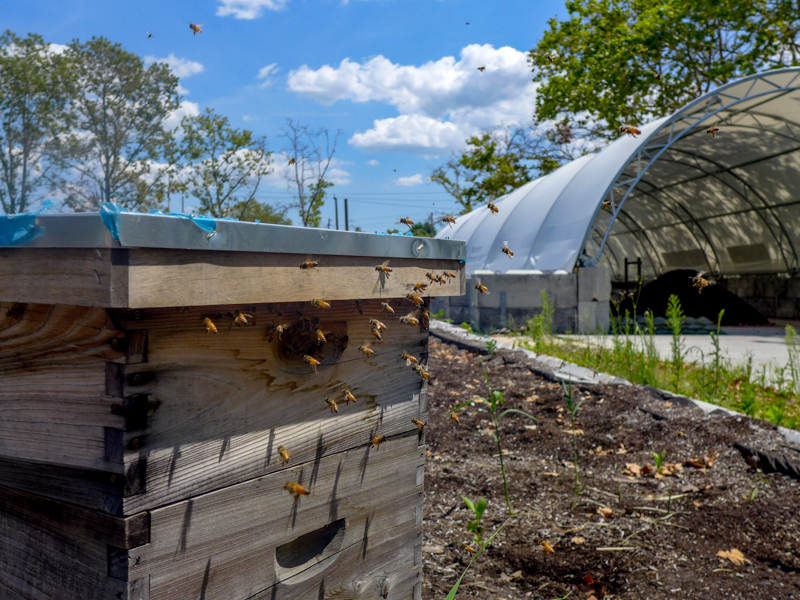 9 :: Honey tastes different wherever you place a hive – and no two hives produce the same taste. 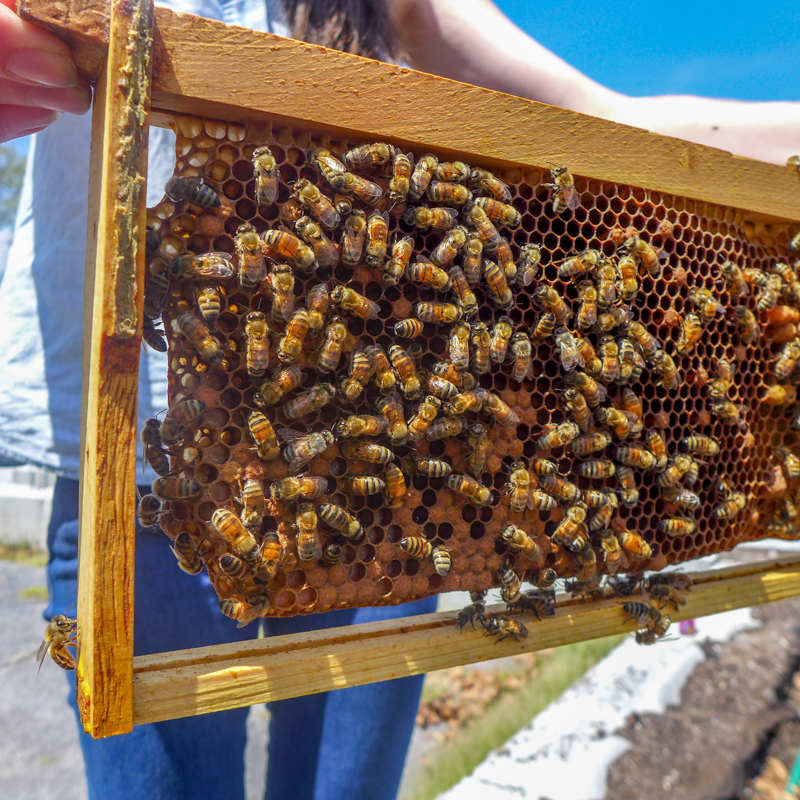 Bees are the only insect in the world that make food humans can eat, and bacteria won’t grow in it thanks to natural preservatives. 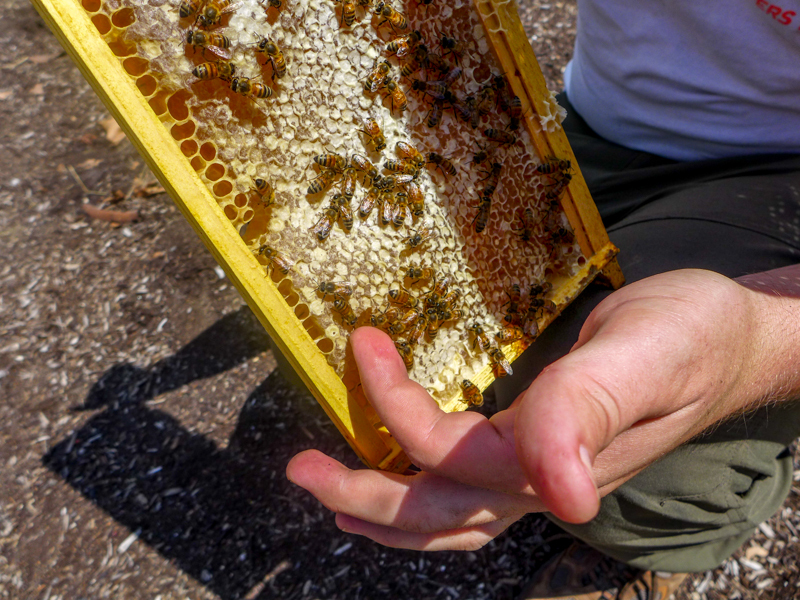 10 :: I now want to be a beekeeper. Let’s just hope I never get stung, eh? 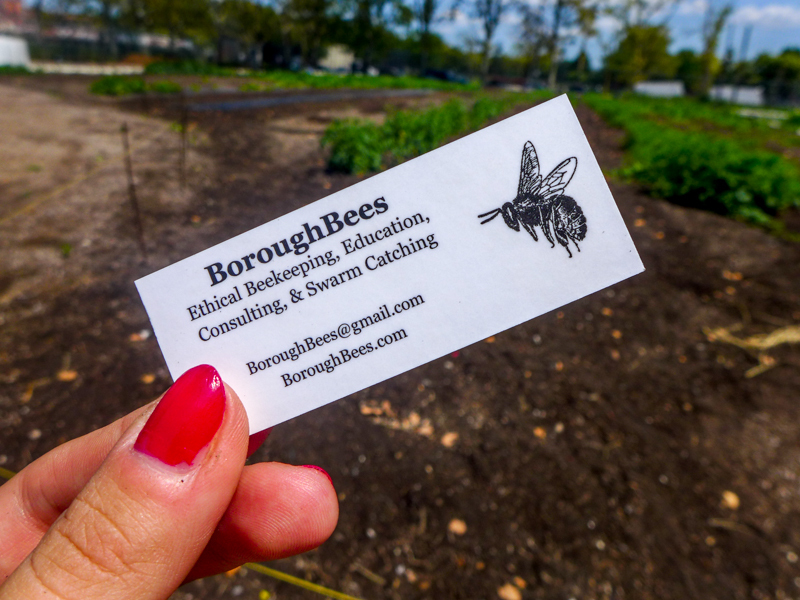 For more information about Tim the Beekeeper and Borough Bees, visit his website. His Twitter is here. Thanks Lyds, that was really fascinating and informative. After reading that it’s sweat and poo, I am glad that I don’t like it! Haha the honey itself isn’t… it just kind of sits in it! Haha yes! 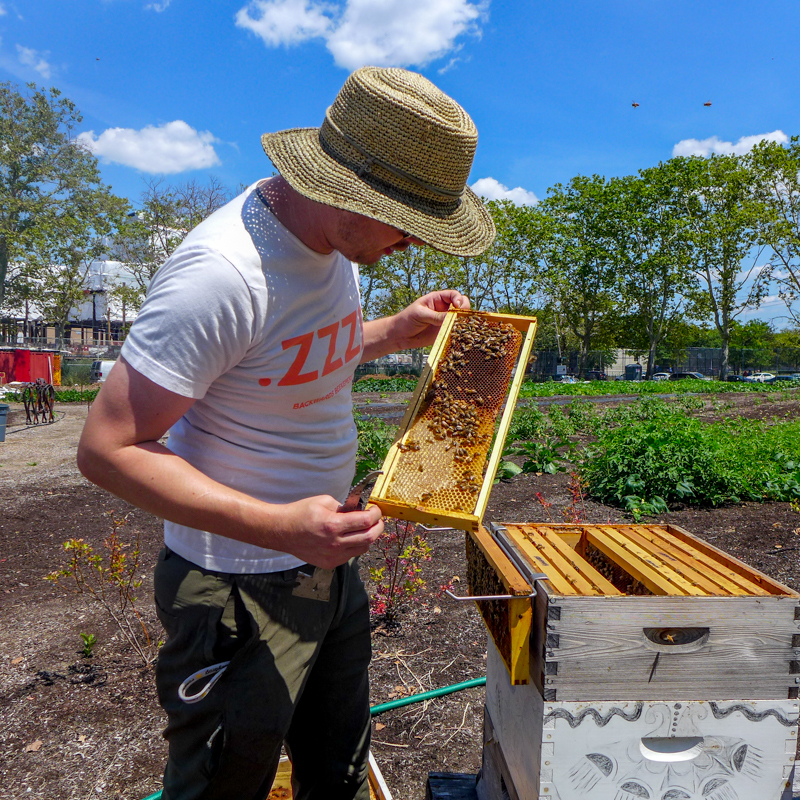 I was surprised how this beekeeper wore zeeero protective clothing and didn’t seem bothered by it!